I am so sorry to inflict this on everyone before lunch, But the creation of this Mozzerella-based monstrosity must be noted. I’m sure it’s an important stage in human evolution or something. 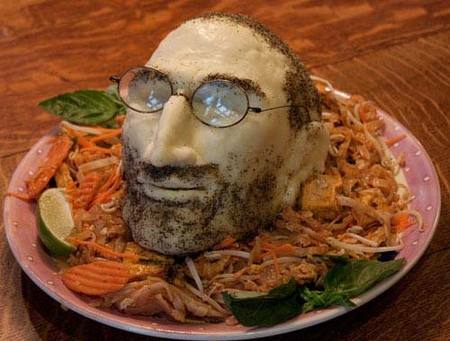 A geeky cook blogger who loves Macs and likes getting creative with uh cheese has carved a recogniseable sculpture of Apple’s CEO Steve Jobs in Mozzerella. He suggests you serve it with crackers and fruit – probably accessorising the cheese head with a pair of wire-rimmed spectacles. His blog post contains an entire How-To. Please don’t is my only I think it’s the beard (flecks of ground pepper) clinging to the puce mottled colour of the skin that I find most repulsive. 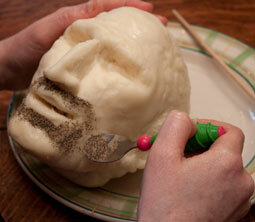 Here’s a photo from the How-To section. Meanwhile, excuse me while I go off and retch slightly. yes i like people doing crazy stuff. but this is more sicky than creative.